Jérôme Reuter's name is well familiar to the majority of modern fans of neofolk and martial industrial, since he's a founding member of one of the most original and successful neofolk bands of the late ~15 years: Rome. Their newest album, released just a couple of weeks ago, is titled "Coriolan" (apparently inspired by the Shakespeare's play "The Tragedy of Coriolanus"). Discogs.com lists it as a full album, but I think it rather belongs to the "Singles & EPs" section. 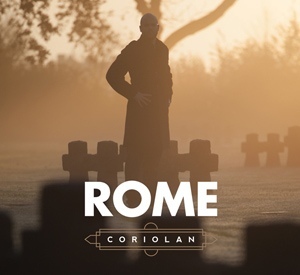 Like many other Rome albums, "Coriolan" is a concept work, and while it isn't a masterpiece, it's fairly enjoyable, especially if you're OK with Rome taking a post-punk direction on this one. My favourite album in Rome's discography is "Masse Mensch Material", and the least favourite is probably "Hell Money" (which many people found to be quite boring, but the follow-up "The Passage To Rhodesia" turned out to be much more interesting). For sure, "Coriolan" doesn't reach the level of "MMM", yet it isn't bad or boring either. Sadly, Rome don't use Bandcamp so I can't insert the player here (which would be quite convenient), but if you want to hear/download "Coriolan" - it's already posted on a lot of places, including dark-world.ru.